Manage orders, inventory, push price updates from Linnworks to PrestaShop- A popular free, open source e-commerce solution. Our PrestaShop integration for Linnworks allows you to manage your orders, inventory and price updates alongside your other sales channels in Linnworks. Order Management: Orders automatically download to Linnworks. After the order is processed in Linnworks, the dispatch notification is transferred automatically to PrestaShop. Inventory Management: Your inventory is automatically synced between Linnworks and PrestaShop, so your current stock levels are automatically up to date. Price Update: Manage product price from Linnworks to PrestaShop - there's no need to log into PrestaShop separately. To use the PrestaShop integration, you must first install it from within Linnworks.net. Click Add New to return a list of available Channel Integrations. Locate PrestaShop on the list, and click Integrate. 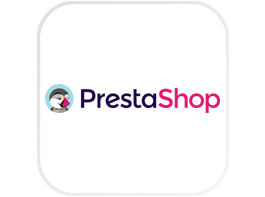 Click on the link at the bottom to review the PrestaShop Connector’s Terms and Conditions first, then click Accept to move onto the next step of the integration. Enter your PrestaShop account name to start the actual integration. Open your PrestaShop Admin Panel. If you are not already logged in, enter the login credentials of your admin account and click Log in. Click Advanced Parameters then the Web Service option. Click on API to obtain the details below. Click the Add New Key option at the top right of the page. Click the Generate button to automatically generate your key. Select all the check boxes as shown below and click Save. After saving, you should see the API Key as shown below. Copy and paste these into the PrestaShop integration API Settings. To complete the integration, please click on Finish. Your Prestashop integration should now show in Linnworks.Net  Channel Integrations. 3)	Locate the PrestaShop entry, and click the Configuration button. 6)	The Test button allows you to confirm there are no errors preventing Linnworks and PrestaShop communicating. Contact EBG Support if Test Reports any errors. 4)	In the Inventory section, the first entry is Update Inventory. If this is disabled, then Linnworks will not tell the listings on the PrestaShop marketplace when Available Stock Levels change in Linnworks. If enabled, then Linnworks will provide these updates. 7)	Max Listed allows you to filter the highest quantity that Linnworks can/will send to the listings on PrestaShop. If Max Listed is set to 50, and your Available Stock moves from 30 to 60, Linnworks can only send 50, and this will not change until the Available Stock level drops below 50. 4)	In the Listings section, the information reflects the information Linnworks currently has about your listed items on the PrestaShop marketplace. This section reflects activities affecting the Linnworks Order Sync on your PrestaShop channel integration. Linnworks downloads orders from PrestaShop with the status Shipping in Progress. Dispatch Notes, when enabled, allows Linnworks to send information about orders that have been Processed in Linnworks. Orders that are Processed in Linnworks are updated to the status Manifested on PrestaShop. The Order Sync Date reflects the date and time of the last successful order download and update for the PrestaShop channel integration. These settings are used to enable Linnworks and your PrestaShop account to connect, and are covered in Step 1. Click Save at the bottom of this window to apply any changes. Linnworks uses the Mapping Tool to ensure that it knows which SKUs in its inventory are connected to which listings on PrestaShop. As such, you should ensure that all of your listings are mapped correctly, or stock levels and prices will not update correctly, and orders may not be picked accurately. 3)	Locate the PrestaShop entry, and click the Mapping button. This screen is divided into two sections. On the left are the listings Linnworks is aware of on your PrestaShop Channel. If this is not correct, or a change is missing, you should see the Download Listings button in the Listings section of the Channel Configuration. On the right is a Linnworks Inventory Search Tool. Each has its own Search box. On the left is the listing Linnworks is aware of on your PrestaShop Channel. If this is not correct, or a change is missing, you should see the Download Listings button in the Listings section of the Channel Configuration. 4)	Use Search to locate the Inventory item that requires a Price Change on PrestaShop. 8)	Enter the Source as PrestaShop. 9)	Enter the SubSource as the name of the PrestaShop channel. 6)	The first option is the Order Download location. This is initially Default, but can be changed. Click on the drop-down list and select which inventory/fulfillment location will initially receive the orders from the PrestaShop integration. 7)	Under Inventory Sync Locations, you control which Linnworks Inventory locations are used to calculate the Available Stock values for your PrestaShop listings. The next step is to map your PrestaShop Shipping services to Postal Services in Linnworks, so orders don’t need to have their Postal Service set manually. Initially, all are mapped to Default. 3)	Locate the PrestaShop entry, and click the Shipping Mapping button. 4) In the Edit Shipping Allocation window, you should have an empty list. 5)	To add a new entry for one of PrestaShop shipping services, click on Create New. For Channel Service Name, enter the name of the Shipping Service in PrestaShop. In Channel Service Tag, enter the Tag value used for the service in PrestaShop. In the Linnworks Postal Service drop-down, select the name of the Linnworks Postal Service that should be used for orders imported from PrestaShop with the Shipping Service to dispatch them correctly. Repeat this for all the other PrestaShop shipping methods you are using. 3)	Locate the PrestaShop entry, and click the Payment Method button. 5)	When mapped, Linnworks will ensure the orders it downloads from PrestaShop reflect correctly which payment methods/providers have been used on the site. Select the Channel Payment Method value, and select one of the Payment Methods from PrestaShop that show in the dropdown list. Then click on the Linnworks Payment Method dropdown. Select the appropriate Linnworks Payment Method that should be used in Linnworks orders when they are downloaded including the above payment method. Press Add to save the mapping, and return to the list. Repeat this for all of the PrestaShop payment methods that are being used by you. Click Save at the bottom of the channel configuration window to apply any changes. 1. Can it work for MultiStore? 2. From my understanding Linnworks will already update stock and get orders from their PrestaShopdirect integration. What’s the difference between your integration and the old one? The standard Linnworks Prestashop integration is a direct website integration. This means it needs a developer to customise it depending on the configuration of your website, and also more maintenance and investment to get it up and going. The integration we provide is designed to be much more customer friendly and can be installed without the services of a developer. The direct Linnworks integration can handle stock levels and orders.